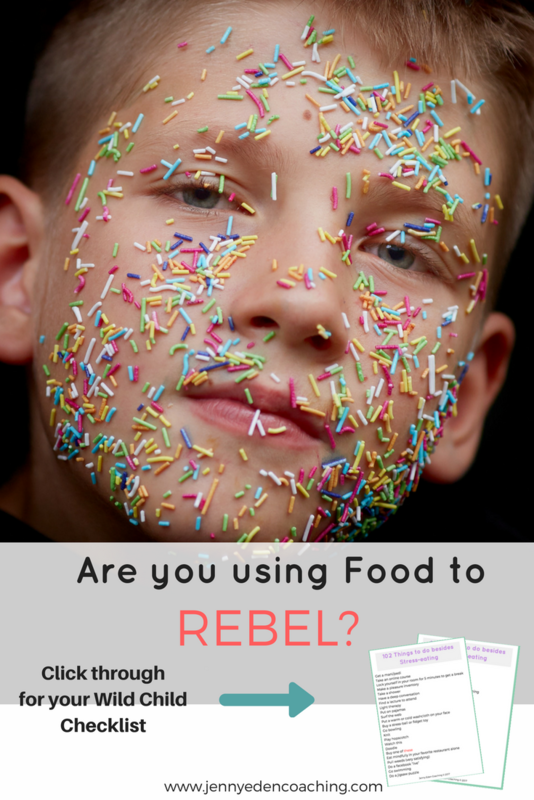 Are you Using Food to Rebel? I remember very clearly being an 8-year old little girl who ate when she was hungry and stopped when she was full. I remember not thinking anything was particularly different about me. Now maybe I was hypersensitive back then but I clearly remember being confused and hurt. Was she commenting on my appetite and making presumptions based on my size? I couldn’t make sense of it as an 8 year old but it always stuck with me because it was one of the first times when I was given pause about my size perception to others and thus started being acutely aware of it myself. It’s these little, sometimes seemingly innocuous comments about our bodies, our appetites or way of eating that little-by-little make an impact on us and fuels our desires to diet obsessively to “fit in” or over-exercise or question our worth based on our ravenousness or weight. As I write about in my book, The Body Image Blueprint, I recall another describing another incident when upon watching my mom throw out an entire roll of cookie dough, I gingerly reached into the garbage, when no one was looking and happily hid and ate the cookie dough in my room for a week. I knew it was rebellious, I knew I was being sneaky but I did it anyway. Because I got the message that certain foods were “good” and certain foods were “bad.” If I wanted the “bad” foods then certainly it meant that something was wrong with me and that I was bad somehow. Now I realize that of course I wanted those bad foods, we all do! Because of the culture we live in, those foods are hugely abundant and cheap and delicious, lighting up the reward centers in our brain which cause us to seek more and more of it. 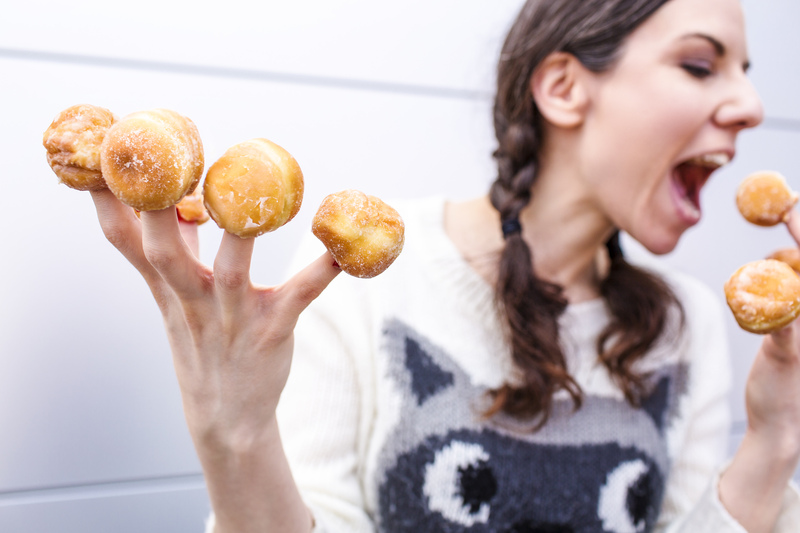 Plus we’re biologically hard-wired to want sweet, salty and fatty foods. And yet we still moralize and judge ourselves and others. If we believe all of the above is true and yet we still seek out, eat and crave those foods then we have a dilemma on our hands. Psychologically, we perceive that WE are bad or wrong in wanting those foods and thereby sneak them to enjoy them and sometimes we even act rebelliously around food just to give the middle finger to anyone who has ever shamed you for your appetite or made you feel gluttonous or wrong for eating certain foods. And there are many more. These phrases came from our parents, our peers, our friend’s parents and they came from society at large. The behemoth of judgement and shame is often too much and we begrudgingly comply with the arbitrary set of rules that have been thrusted upon us. We start to listen externally rather than from within to make our food choices. We lose trust in ourselves and we become resentful at the rules that dissuade pleasure with eating. So what do we do? We rebel! We rebel by eating whatever and whenever we want as a radical departure from and a big F you to anyone who tried to cage us and box us into a certain way of eating. We do it even though it often ends up only causing us angst and maybe even physical distress. My solution to this? Slowly start to rid yourself of scarcity and morality mindset around food. Start to see food as simply energy that has different consequences on our bodies and how we feel. Start to listen to and trust that inner voice and try to drown out the ones of yesteryear or the experts that don’t personally know YOU and your own deep web of physical, emotional, familial, societal and biological stories. The more abundant we feel around food, the less we feel called to rebel or binge or feel fear around food. Think about it. If every single food was totally allowed and encouraged and celebrated, no matter what it is or its nutrient density, those foods would stop having a major pull and allure. Sure, we may eat a ton of it in the beginning, just like a caged animal runs around and joyfully plays once freed. But, eventually the novelty wears and we can become grounded and start to make choices that truly fuel us, mind, body and soul. One note about rebellion: We all have a side of us that finds adventure and excitement at breaking the rules or doing something “naughty” or even out of character. We’re a society contained by our many rules. Why else do we see so many political sexual scandals? Part of the excitement of these scandals is seeing what they can get away with and the fact that it’s not allowed or universally accepted. It makes it feel more exciting, adventurous or even dangerous and we get a rush from that. We get that also from food. So, you can change the story here by making these types of food totally uneventful, available, and decidedly “not naughty” to take some of the allure out of it. Couple that with allowing pleasure and awareness in the eating experience and owning the decision to eat them will help as well. Lastly, because many (most?) of us have this “wild child” part of us, we need to find alternative ways to let him or her out in a way that is legal, socially acceptable yet still exciting. When we allow ourselves to do this, once again, the need to do it with food becomes diminished. Grab my list of “Safe ways to let your wild child out” checklist for some juicy and fun ideas.